Increasingly the notion of brand and the reputation of shipping companies has an effect – but does this mean anything for seafarers, and if so what…do people work only for “strong brands”, or is it down the list of considerations? You can perhaps think of “branding” in shipping as the first time any vessel flew its own “house” flag. A means of differentiating it from its competitors. You might have thought this would have expanded to having “branded” sails, but this would probably have been prohibitively expensive. It was not till the steam age that the concept really took off, and the funnels proved to be a very effective means of differentiating. Merchant shipping lines often painted their ships’ funnels in distinctive colours to distinguish them from competitors. Some were very literal indeed – yes, Blue Funnel line had blue funnels, and the likes of Blue Star had a big star on them. These made the ships recognisable, and were a point of pride. So all of a sudden, the shipping line was visible and it mattered how the vessels looked. On his death bed, Victorian magnate Alfred Holt said, “keep my funnels tall and blue”. This was a point of immense pride, and also rivalry. In many ways a “brand” is a promise and commitment – it is a notion which links all the ways in which a company performs or delivers. Perhaps the most successful “shipping” brands today are Maersk, and then probably the cruise lines. Maersk, with its strong blue and seven pointed star. This look perpetuates across all their businesses, and provides a sense of common purpose, vision and expectation too. The world’s biggest shipping company must be doing something right, you would think…and the statement that it is proud of its achievements shouts out from every hull, funnel, container and truck. 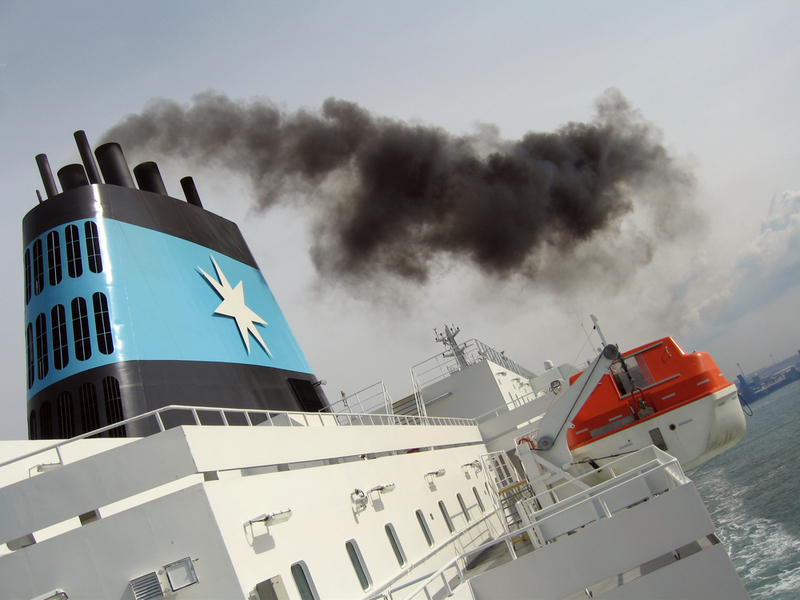 The story behind the Maersk seven-pointed star logo is quite romantic. A.P. Møller’s father, Captain Peter Mærsk Møller, wrote that the seven-pointed star logo came into existence in 1886 when his wife, Anna Møller, accompanied him on a vessel and became seriously ill. While praying for his wife’s well-being, Captain Mærsk Møller saw one star on that cloudy night and was filled with hope. The white star was retained as the funnel emblem for the company’s vessels ever since. Today’s Maersk logo and typeface was designed by the Danish architect Acton Bjørn in 1973. A lot of time, effort and money has gone into creating the Maersk brand – there is no such thing as an accident when it comes to such companies controlling how they are seen and perceived. For cruise lines, the concept of “brand” is perhaps even more important. When they are looking to attract people to sail with them, they need to project the right image and send the right message out. The branding of cruise lines is a vital element of how they do business. Disney Cruise Line and its family focus, Holland America Line for traditional, older cruisers, and Norwegian Cruise Line with its rock climbing and the like, for younger and those who want cruising without the “regiment”. There are many more – Cunard and its sense of tradition, P&O playing on its “Britishness”, Carnival for parties and Royal Caribbean for everyone else. Each company has its sense of self, driven by those it seeks to attract. The branding is all part of that, and is vital in creating a business model. You know what you’re going to get with a well-branded product or service. The brand with its specific combination of logo, words, type font, design, colours, personality, price, service, provide a bundle of attributes and a promise. WHAT DO EMPLOYEES THINK OF THEIR OWN BRAND? While customers may know all about brands, and the responses they engender – what about employees? What effect does and can branding have on them? An employer brand is the term commonly used to describe a company’s reputation as an employer. In essence it is the image of an organisation as a ‘great place to work’ in the mind of current employees and key people looking in. Think Google, Apple, IBM, et al – they work hard to create a mystique about what it means to work for them – to be part of something special, which by default makes the employees special. Alas – when you look down the list of the 100 top companies from the UK and USA, Europe to Asia…there is not a single shipping company which figures in the high rankings. It is almost like shipping does not exist when it comes to being a “good” employer. Which is very worrying indeed. So, we have to ask – does it matter that shipping companies are not considered as “top employers”? The initial response would have to be that yes, yes it does matter. From a perspective not just at sea, but ashore too. Where are the talented people going to come from if they think the industry should be doing more? So what should be done to make things better? Shipping companies need to sharpen up their acts – they need to shout about the good things they do. Maersk, as we have said, has been one of the more vocal, and this has undoubtedly helped them to secure their market leading position. But this cannot be about empty promises, there needs to be substance underpinning all that is done. It needs to be recognised that branding efforts really are important to employees – in shipping, they may be even more important to seafarers than to customers. So owners need to recognise that, and build on what it means to belong to “ABC” or XYZ” shipping. Communication is a key, and companies need to talk too…and importantly, listen back to what seafarers are saying. A dialogue is vital. A stronger brand alone isn’t going to fix this problem. While efforts to create all the elements may help – there needs to be a true, honest and demonstrable commitment to deliver for employees. Ashore or at sea, the owners who look after their people are more likely to deliver for clients and even for society. We cannot downplay how important shipping is to the world – so we have to remember, a positive image for shipping means a better life at sea. There are things which can be done, and should be done better –but does it matter? Seafarers are still not searching for jobs perhaps in the way that people do ashore. There is not enough information available – and so we need to see a list of the top employers. When we can see who the best employers are, then we can ask why – and then slowly we can start to build an impression of what it means to be a good ship owners, one that cares. Alfred Holt did not just care about his blue funnels – his dying wish was that the company would look after his crew. He cared, and his company “brand” reflected that. What do you think? Does the brand of your shipping company matter and would reputation affect your decision to work for one company over another?